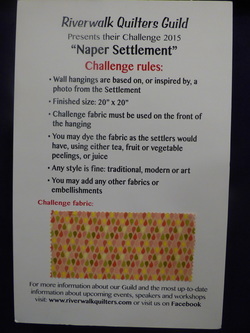 This year's Quilt Challenge is "Naper Settlement". The wall hangings are base on, or inspired by, a photo from the Settlement. Each quilt should be bound, and is due on March 11, 2015. Below are the 16 quilts that were produced for our 2014 quilt challenge. They have been travelling all over Naperville, in all 3 libraries, at City Hall, and at Naper Settlement. They will be on display at our May 2016 quilt show.